Essential Property Maintenance is a lawn care and landscape maintenance contractor based out of Calgary, Alberta. We specialize in developing comprehensive lawn care and landscape maintenance programs for condo associations, townhome associations, apartment buildings and homeowners associations. Schedule Your FREE Calgary Condo and Townhome Maintenance Estimate Today! Are you looking for a reliable landscaping company to take care of the landscaping, gardens and grounds surrounding your condo, townhome or apartment building? 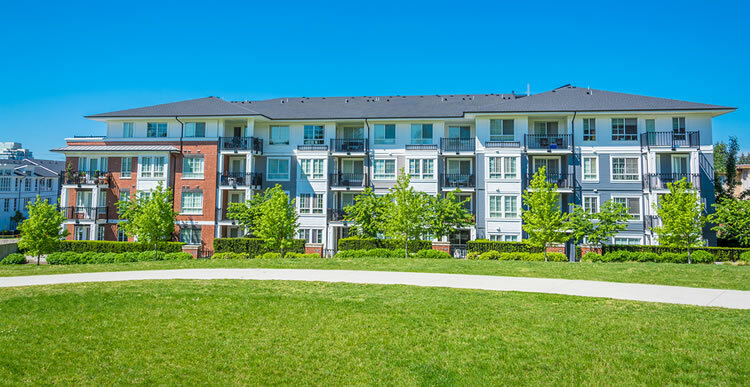 The appearance of your building and it’s grounds is important to both you and your residents. A great looking, well maintained landscape on your property helps attract new tenants and makes your current tenants feel better about where they live. A well maintained lawn and landscape can help deter crime, make residents feel safer and enhance the beauty of your property across all seasons-spring, summer, fall and even in the winter! From mowing the lawn and doing semi-annual yard and garden maintenance for a duplex all the way up to maintaining the lawns and landscaping for dozens of units in a strata. The team at Essential Property Maintenance will work with you to develop a maintenance program that will keep your lawns, gardens and landscaping looking happy, healthy and well care for. What’s most important when dealing with a lawn care and landscaping professional is that they are reliable and show up to complete the work, when it’s scheduled. You’re hiring a landscaping contractor because you don’t want to do this work, yet you recognize that it must be done to keep your property or the property you manage looking beautiful. We understand this. The end result is a lawn and landscape that will look clean and well cared for. It’s impossible for us to quote your landscape maintenance project without coming for a visit and consultation so if you’d like to get that process started give us a call at 250-812-4676 or use our online contact form and we’ll get right back to you.